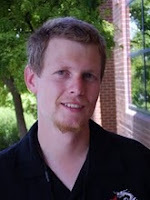 Catalogue of Organisms: Arthropods in the Precambrian? The Ediacaran animal Spriggina floundersi, from here. 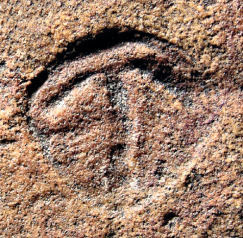 The Ediacaran biota has been touted as one of the great mysteries of palaeontology. Comprising the latest part of the Precambrian era, the Ediacaran is generally believed to have given us the earliest known animal fossils. However, palaeontologists have disagreed on just how the Ediacaran fossils relate to modern animals (see McCall 2006 for an exhaustively detailed review). Some see the Ediacarans as including the ancestors of groups that remain with us today: jellyfish, corals, comb jellies, sponges. Others see Ediacarans as outside the modern lineages: ancient animal groups that were swept aside by more modern animals at the beginning of the Cambrian. And some have even questioned whether the Ediacarans were even animals at all, suggesting links instead to fungi or Foraminifera, or even that they were an entirely independent lineage unrelated to any modern multicellular organisms. 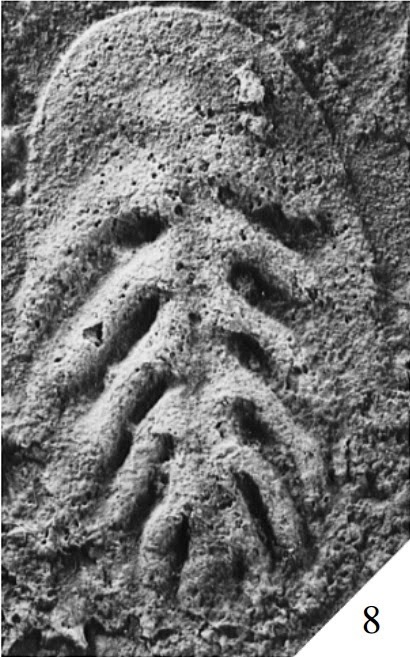 In 1996, Benjamin Waggoner proposed the name 'Cephalata' for a clade uniting the arthropods with two groups of Ediacaran organisms: the Sprigginidae and the Vendiamorpha. These are among the most undeniably animal-like of the Ediacarans. The sprigginids (including Spriggina shown at the top of the post) have an undivided 'head' followed by a long segmented body. The vendiamorphs are shield-like organisms that also show evidence for segment-like divisions behind the 'head', such as branching internal structures that may represent side-branches of an internal gut. The vendiamorph Vendia sokolovi, from Ivantsov (2004). It is difficult to see these taxa as anything other than mobile animals. One supporter of non-animalian affinities for the Ediacarans, Adolf Seilacher, did suggest that Spriggina was a sessile organism, maintaining that the 'head' was in fact a holdfast while the 'body' extended upwards like the frond of a sea pen (I have seen a memorable reconstruction, though unfortunately I can't recall where, showing an individual of mobile Spriggina crawling past a cluster of sessile Spriggina). However, the numerous Spriggina specimens that have been found in Australia and Russia are invariably preserved lying flat, while sessile organisms from the same locations are preserved with the holdfast below the level of the body. Vendiamorphs, on the other hand, are simply not shaped in a way that allows them to be seen as anything other than lying flat. An immobile sprigginid or vendiamorph lying flat below the water would have been vulnerable to being buried by sediment, without any way of digging itself back out. But if sprigginids and vendiamorphs were definitely animals, what kind of animals were they? It is at this point that things get a bit more vague. Their segmented appearance immediately suggests arthropods (and onychophorans) or annelids, but there is not a great deal to suggest one or the other. The differentiated head of sprigginids suggests the head of an arthropod, while vendiamorphs have been compared to the larvae of arthropods such as trilobites. 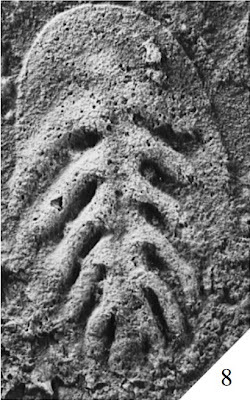 However, it is unclear whether the Ediacaran taxa possessed anything like the limbs of arthropods and related taxa. The segments of sprigginids may be separated at the edges, and some have argued that folds in vendiamorph fossils are suggestive of limbs underneath a dorsal shield, but there is nothing that one would call unequivocal. Lateral outgrowths of sprigginids may correlate to annelid parapodia instead of arthropod limbs, and folds in the bodies of vendiamorphs may be nothing more than that. We recognise relationships between fossil and extant animals on the basis of whether they have features in common, but our assessment of what features they have may be coloured by what features we expect to see. Another possible vendiamorph, Parvancorina minchami, from here. Note the fine parallel lines on the body, which some have interpreted as the outlines of limbs. Some authors have drawn attention to a feature of both vendiamorphs and sprigginids that is visible in the image of Vendia above: their so-called 'glide reflectional symmetry'. Though their bodies appear segmented, the segments do not go straight across the body as one might expect. Instead, the left and right sides of the body are slightly offset from each other. For this reason, some authors have claimed that these animals do not show true bilateral symmetry and hence argued for placing them outside the Bilateria crown group, along its stem. However, others have suggested that the offset between sides may be an artefact of preservation. Even if it was indeed a feature of the living animal, glide reflectional symmetry may not necessarily force the sprigginids outside the Bilateria: a number of living bilaterians also show a certain degree of symmetry offset either as adults or during development, including basal chordates (Waggoner 1996). During the period of the Cambrian, directly after the Ediacaran, we have access to beautifully preserved fossil deposits that have allowed us to characterise many animals from that period in exquisite detail. 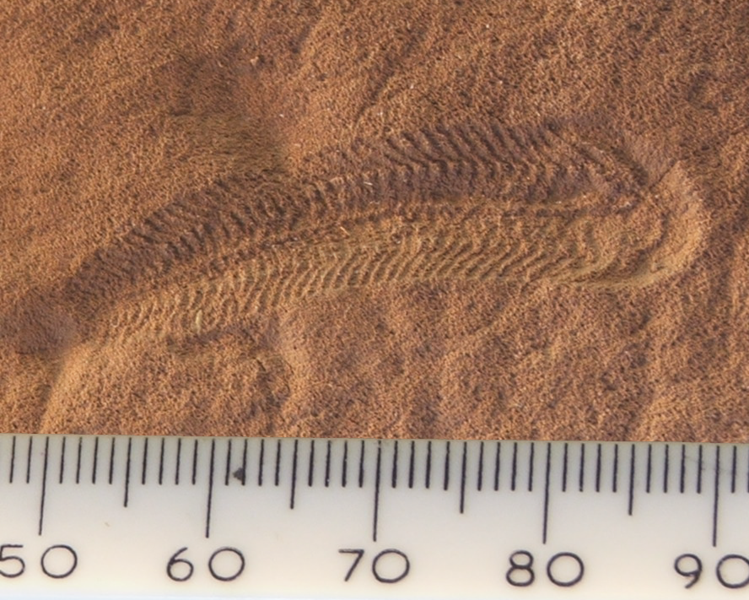 No such fossils exist for the Ediacaran; instead, Ediacaran animals are mostly preserved in coarse sediments that preserve only relatively broad features of the fauna. This can turn the Ediacarans into tantalising shadows, and what we see in them can say more about our assumptions than the animals themselves. Ivantsov, A. Yu. 2004. New Proarticulata from the Vendian of the Arkhangel’sk region. Paleontologicheskii Zhurnal 2004 (3): 21–26 (transl. Paleontological Journal 38 (3): 247–253. McCall, G. J. H. 2006. The Vendian (Ediacaran) in the geological record: enigmas in geology's prelude to the Cambrian explosion. Earth-Science Reviews 77: 1-229. Waggoner, B. M. 1996. Phylogenetic hypotheses of the relationships of arthropods to Precambrian and Cambrian problematic fossil taxa. Systematic Biology 45 (2): 190-222. Ediacaran critters are fascinating and frustrating. Paleontological Rorschach tests? Somebody must have made that observation: ah, a google search for that plus ediacaran find 85 hits. "Thank you for this post! The placement of the Ediacaran "weird wonders" is a fascinating problem. Note that, had you been writing this few decades back, the fact that these critters resemble both arthropods and annelids would not have seemed problematic: at that time (up, I think, until the ??? late 1980s ??? when molecular phylogenies started assigning arth and ann to very different supra-phylem groups (arth to the ecdysiasts, and annelids to… are they lophotrochozoans? 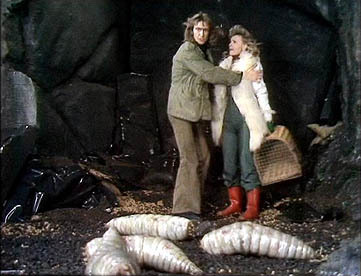 anyway, closer to mollusks and brachiopods than to arthropods despite the superficial resemblance given by their segmentation) arth and ann were thought to be closely related. But now resemblance to these two phyla just dramatizes their strangeness! To be sure I am following you: when you speak of "basal chordates" as having "glide reflectional symmetry" … are you thinking of Cephalochordates like amphioxus? PPS: One of the options for commenting given by your page was a Google one. Note that I am now writing you from a Google mail account: posting to your site didn't work either before or after I logged in to my Google mail..."
And in reply to Allen: Yes, I believe it was the late 1980s/early 1990s when the concepts of 'Ecdysozoa' and 'Lophotrochozoa' originated, though it wouldn't be for another decade or so before they became the default paradigm. Placement of sprigginids and the like on the bilaterian stem would correlate with the suggestion that has been made that, rather than being flatworm-like as was assumed in the past, the earliest bilaterians may have been relatively large, probably coelomate, probably pseudo-segmented. Each of these are features that are found in all three of the main bilaterian lineages of ecdysozoans, lophotrochozoans and deuterostomes. And yes, by 'basal chordates' I primarily meant amphioxus (and also, I believe, lampreys). Amphioxus go through a glide-reflective stage during development, though by maturity they have mostly returned to symmetry. Where does that leave "minor" bilaterians, like acoels? Secondarily reduced, or outside a deuterostome-ecdysozoan-lophotrochozoan-Spriggina clade? My inclination would be towards the latter, if Spriggina was a stem-nephrozoan (Nephrozoa = deuterostomes + ecdysozoans + lophotrochozoans) and acoels are non-nephrozoans. Of course, if Spriggina is a crown-nephrozoan then the question becomes a lot less relevant. 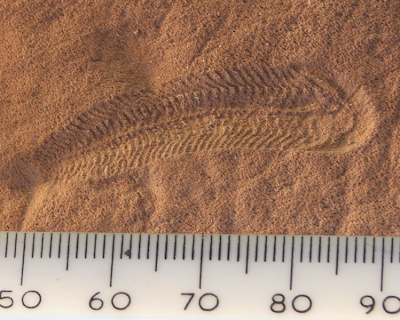 Is it possible that no one who specializes in Ediacaran has ever looked at a Triops specifically the ventral surface or that of any of the animals that are members of the order Notostraca? I don't think I am exaggerating when I say they are virtually a perfect fit for Spriggina fossils, with spriggina being the earliest identifiable ancestor of modern Notostraca, which are themselves considered living fossils, appearing in the fossil record about the same time when spriggina fossils disappear from the record. I wish I could send you the specific photo that I am using to compare to various spriggina fossils. I'm certain you'd see what I see. Realizing just how similar spriggina is to modern triops does take looking at more than just one or two spriggina, because every fossil seems to show a different feature more clearly than the others. Still, I can say in spriggina examples where the headshield area is clear, the features on the headshield of the spriggina lose their ambiguity completely. The only difference between the headshield of the two is the triops has one that is larger while still maintaining the same shape as on spriggina. Oh by looking at the triops you can positively identify the mouth on the spriggina, because on the triops it is identically shaped and in the exact same position relative to the head shield on the spriggina and the food groove. The food groove of the spriggina along with the rows of appendages also is a near perfect match to the triops especially just below the head shield area. What differences there are could easily be explained by the modern triops being very much an aquatic acrobat, and to swim like it does it does the ends of its middle parts of many legs broaden out to flat paddles. The spriggina could have been strictly a bottom crawler, and thus lacked that on their legs. If you assume that, it becomes pretty obvious that if the spriggina is the earl ancestor of any modern organism it would be for Notostraca. If you get a moment I'd love to hear what you think provided you can find that photo. If not I can send it. Wasps with Fangs on their Feet?